Damage to Property is Enormous. Several Lives Were Lost and Other Injured. The most destructive cyclone or hurricane that ever visited this community passed over Oregon about 10 o’clock Monday morning leaving ruin and destruction in its path. It covered a large area and it is estimated that the damage will run into hundreds of thousands of dollars. After the storm had passed the village streets presented a sorry appearance. Scores of trees in all part of the village were torn up by their roots or broken off, and in some cases trees were entirely stripped of their limbs. Many of the trees were thrown across the streets completely blocking them. Many chimneys were also blown down. The village lighting system was put out of commission. Every lamp was badly broken or damaged. Only two of them could be repaired as to be used that evening. The Oregon Telephone Company are heavy losers by the storm. Their lines in every direction are down, some poles broken and wires tangled. Throughout the farm districts is where the damage was most severe. On the Bartlett farm, west of the village, the storm was responsible for the loss of a human life. 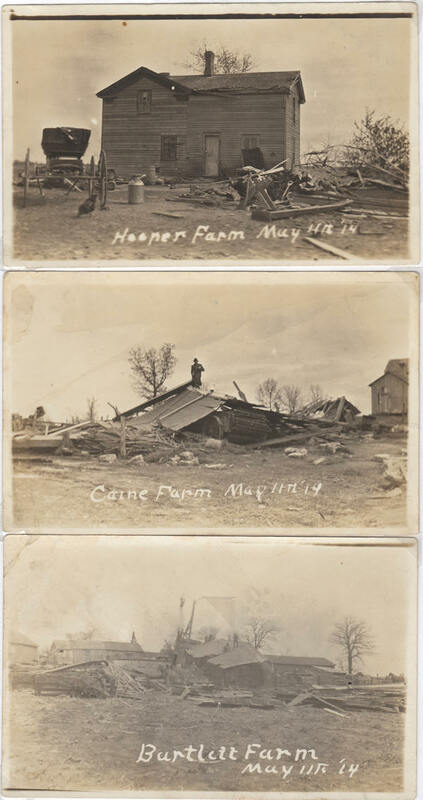 The tenant, Bernhart Fredrickson, and little son, Layman, were in the barn when the storm struck and both were caught in the wreckage when the barn was crushed down. Mr. Frederickson escaped with an injury to his hip, but the little boy was killed. Four of Mr. Frederickson’s horses and some calves were also killed when the barn fell. At the Morton Peterson farm, just west of town, the damage will be about $3,000. The barn and tobacco shed was completely wrecked. Five head of fine Holstein cattle, one horse, some hogs and sheep were killed when the buildings fell. The herd man had a narrow escape. He was in the hay mow when the barn was wrecked and was blown out of the barn. He was only slightly injured. Other farms in this vicinity who lost their barns are Arthur Alling, Alfred Nelson and Chas. Friday. It is impossible to get particulars because of the fact that telephone lines are down. The barn on the Henry Matson farm was partly wrecked. Many of the silos in the surrounding country were blown down and windmills as a rule were also wrecked. It would be impossible to mention all of the tobacco sheds that were blown down and the lumber scattered over fields—perhaps not over a dozen sheds are standing in the storm swept district. Nearly every farmer suffered loss to some extent. In the south end of the village at the house of Chas. Devine his farm was completely turned upside down, and is standing with the building boards against the house. The front of J.P. Brophy’s harness shop was blown out, taking the wooden awning with it. At the Cal Sliter home a tree was blown over and crashed through the roof of the house. Considerable damage was done at the Prairie Mound Cemetery. Trees were broken down and several monuments blown role. Reports from Stoughton seem to indicate that the storm was even more severe than in this locality. John Sveum, residing a half mile west of that city was killed when the barn was wrecked. His brother, Ole, on the same place, had his right arm broken and sustained severe scalp wounds. In the Herman Showers place, where fire wiped out everything but the dwelling house just about a year ago, there is again nothing but the house standing. Mr. Showers just had left the barn for the house and was lucky to escape injury. He caught hold of a post to which he clung, but said that he thought his legs would be broken by the force of the wind. Everything in the line of building on the Chas. Hull farm was destroyed, except his house and one tobacco shed. Mr. Hull had one of the finest barns in that vicinity. The Stoughton high school and other buildings in the city also suffered more or less. The vicinity of Verona also suffered heavy damage. The walls and chimney of the laundry at the county poor farm were almost completely demolished by the tornado and lightning which struck it. The chimney where the lightning struck crumbled and crashed to the ground, burying Miss Olson and Lizzie Dorman under the debris. Miss Olson was killed by the stroke. Mrs. Bakken, Kune and Sthel were also caught in the wreckage, but were able to escape easily. Four men, by working furiously for an hour, were able to free the two under the pile of debris. A number of barns and other buildings in that section were wrecked. Sofus Nelson reports that on his mail route there are 22 tobacco sheds, 2 barns and 4 silos down. H. V. Chappel, mail carrier on route No. 1, was caught in the storm and his wagon turned completely over. Mr. Chappel escaped injury but his wagon was wrecked. John Gilbert, on route No. 4, had a similar experience. 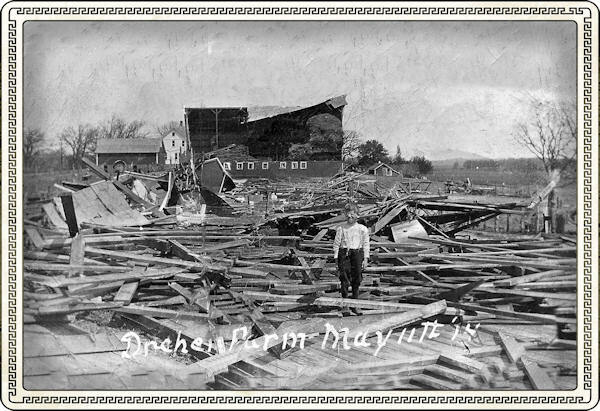 Notes from Phil Peterson (4/15/11): The Dreher farm was south of the Alpine branch of Oregon Community Bank, all the buildings are gone (OAHS has photo of original farm). This barn was rebuilt, in the early 1950’s and the top floor was again hit by a tornado, and then was replaced with a rounded quonset type roof. This barn was moved in January 2008 across neighboring farm fields to the west , to it’s present location at 1239 S. Fish Hatchery Rd., home of Paul Morrison’s Wood cycle of Wisconsin . The Bartlett farm is at 5387 Co Hwy CC now owned by the Phil Peterson family. This is the barn where the young boy lost his life. The two oaks in the picture are still standing today.